I finished my November and December blocks. The challenge for November was to use some Elizabeth in the block. We were given the centers we had to use. This one uses Parisville, Elizabeth and Spirit Animal. 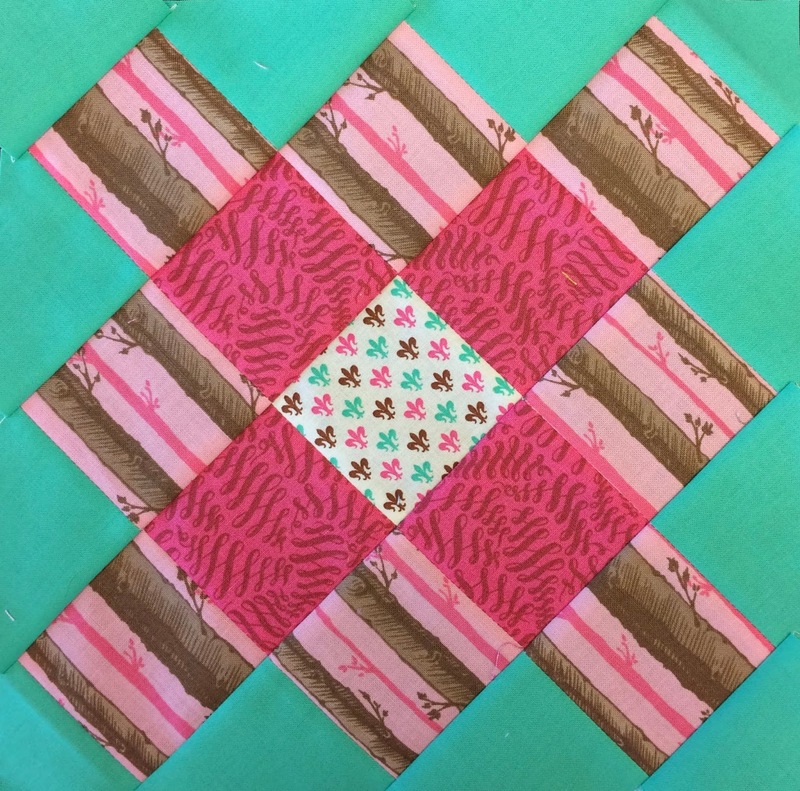 The December challenge was to use a stripe in the block. We were given the center. Parisville, Eden and Full Moon Forest. There are still a few centers we need to use in blocks but they are coming along. This has been really fun and challenging. It has forced me to use fabrics together that I probably would not have done. I am making progress on my MSU quilt, but extreme socializing is getting in my way, LOL. Such a horrible problem to have right? I believe that is on my "to do" list for Saturday. If anyone has ideas for things I can can with apples please link me some recipes! We usually do only applesauce. These are pretty tart apples so they are good for baking. I tried pie filling but was not impressed with it. I also make caramel apple jam and it was great, but trying to cut down on sugar. I can do applesauce sugar free and it comes out just fine even with tart apples. Low sugar apple crisp recipes appreciated too. I was working on my MSU quilt for the camper this weekend. Or trying to anyway. Finn decided that he wanted to be right next to me to "help". (It's really big, thanks to Carol D. for her pattern). 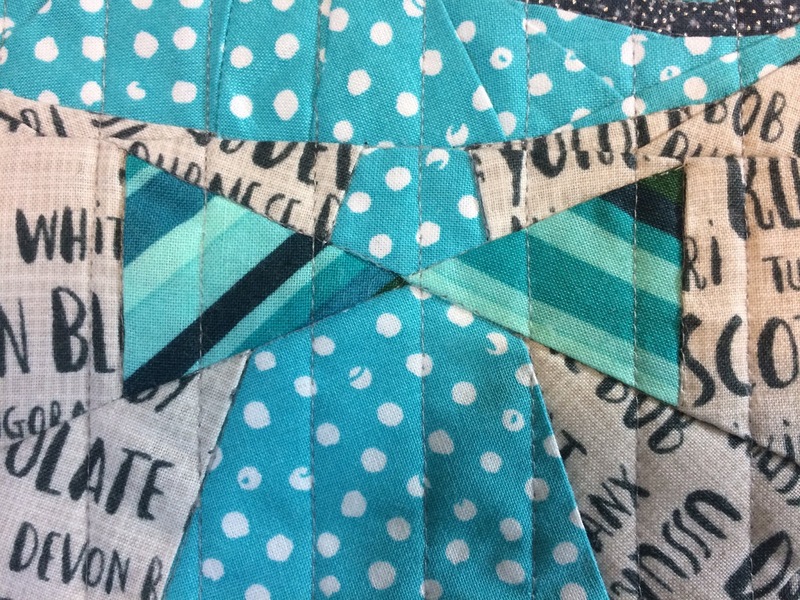 I am so close to having the patchwork sewn together. It was tough with all my help. I usually encourage the cats to lay on the rag quilt you see in the background. Finn was having NONE of that. This is where he started out. which you see I have actually pushed back at this point. "This green is my favorite"
"Let me just roll around here and help you". This concludes my weekend of "Sewing with Cats". Next up actually getting something done! I realize that I have not posted in awhile. We went camping and my time was consumed with preparing to go and then the actual camping. Makes me want to retire even sooner. We did manage to set a tentative date for my retirement, and I am so excited about that. OK on to our camping trip. We camped at a campground in Standish, MI. LOVED this place. Of course we traveled with the cats. This was my favorite photo of Finny and my husband on the drive to the campground. Here we are all set up. You can see the pet tent in the foreground. That's what we put the cats in when we want them to be outside with us. 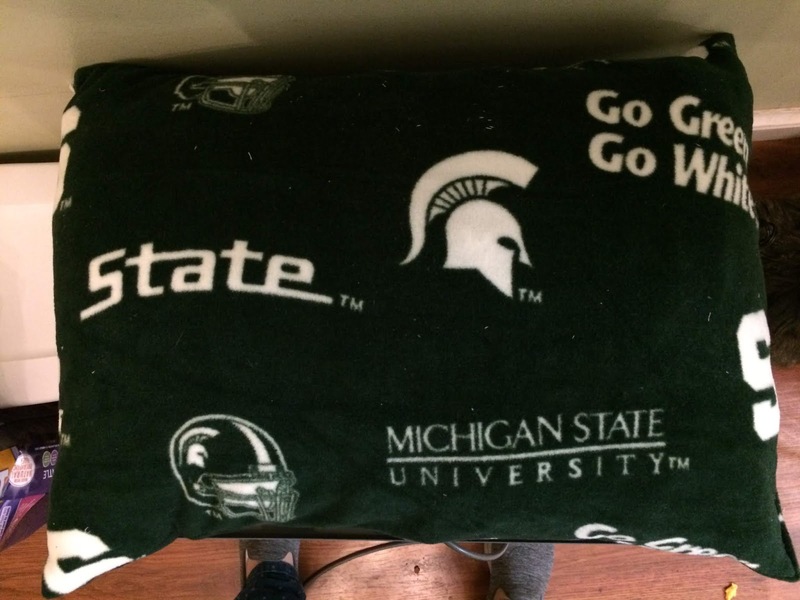 Thanks to my sweet BIL and SIL for the Spartan mat! We really could have used 2 of these. There was not much grass and lots of sand. I implemented a take your shoes off at the door policy. You can see the truck in this photo too. A quick shot of the inside of the camper. You can see that white table where the dinette table should be, that's my sewing table. We took the dinette table and used it for a cat coffee table. We visited Northwoods SEVERAL times and found this woodsy friend. I did manage to squeeze in a quilt shop. It was called Bittersweet and was located in Pinconning MI. You can see the beautiful stained glass windows as this is in an old church! Really nice shop and really nice staff! I found some Coral Queen of the Sea. I also picked up some of this sparkly MSU fabric and that most adorable black cat fabrics! 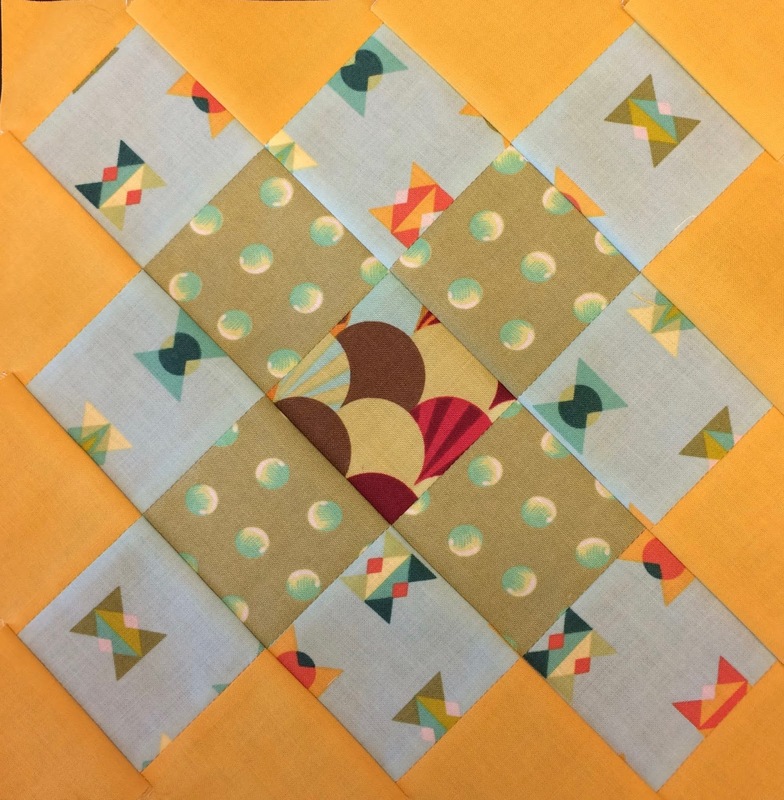 I brought a quilt along that I needed to bind. I can't really show it just yet because it is a gift. Cole is always near when I am binding. Finn seemed to like hanging out on the steps. I throughly enjoyed both the indoor and outdoor pools. During the week they have a water aerobics class every day. (which I ended up doing alone as the other ladies could not keep up with the tape). After years of doing regular Zumba this seemed pretty tame to me, but I still enjoyed it! I could really get into that! We made friends with the couple camping next to us. It was interesting, they also own an NFC, like Finn. She works for MSU and is a quilter!!! as they are in the same camping network as we are. This was on a heyride one afternoon. We went out for dinner with them one night then stopped for ice cream. Another night Chris and I checked out this adorable cheese chop. There was another large mouse in the parking lot, but this one was on the roof. Sadly our trip did come to a close as we headed home on Tuesday afternoon. I think we have one more trip planned before we winterize the camper. Just a quick minute to share. I finished my bee blocks for September. Additionally, my SIL is gearing up for a garage sale this weekend. We have been bringing stuff to her, going through stuff from our garage and basement. I decided last weekend to go through the fabric I had in bins, in my basement. I managed to clear out EIGHT bins worth of fabric for the sale!!! I sure hope someone can use all this fabric. Lest you think I have none left, I still have many more bins left. along with all the other stuff we sent. Two pick up truck loads full of stuff!!! I only have a quick few minutes. 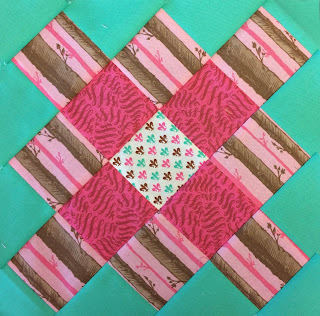 I want to share with you something I do with the scraps I would otherwise discard. I buy half a yard of fleece and fold it in half RST. I sew the two sides together to make it like a pillow case. I put this in a plastic bin bottom to keep it stable, with the case opening at the top. Then, as I sew, and have trimmings, I drop these into the "pillow case". I think mine take me about 6 months, with stuff I would otherwise throw away. those to small to use and HST trimmings etc. I turn the edges in on each other and zig zag the opening shut. This generates a great floor (or pet) pillow! This is my second pillow and my son has claimed them BOTH! It was the perfect way for him to elevate his leg when he had the blood clot. It did not squish down like a regular pillow would. You could probably do a larger one if you wanted to also. Or if you have a smaller pet a smaller one. OK, so go forth and make all the pillows! 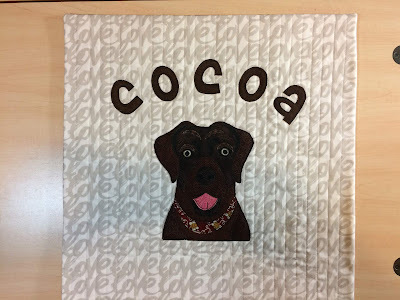 My friend lost her chocolate lab recently. They had her for a long time and she became ill recently. none of the vets could diagnose the problem. She continued to decline and recently lost her battle. My friend was so distraught. It is never easy to lose a pet no matter how long they are part of your life. So, of course, I decided I needed to make something to commemorate her Cocoa. I made this pillow cover! I really liked that I could use the "love" fabric for the background. I think this is the entire extent of my dark brown fabrics in my stash too! 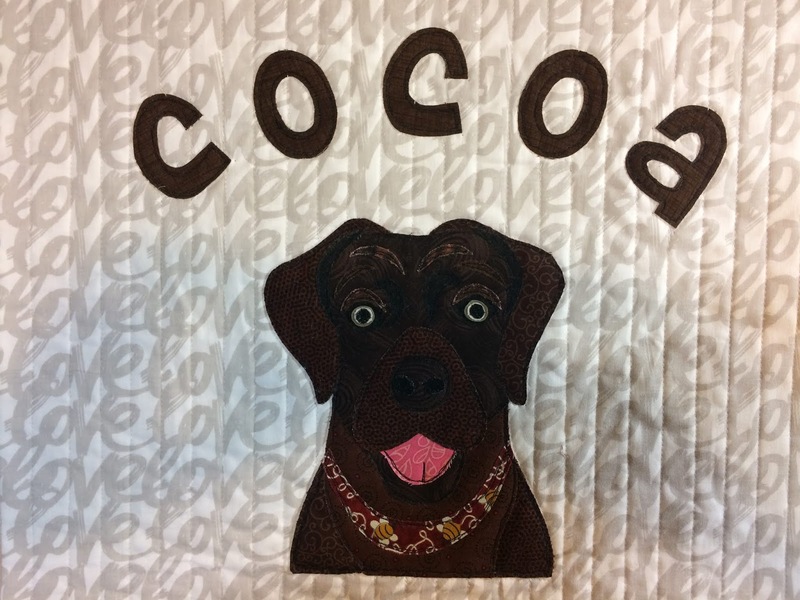 Of course Cole was modeling the backing which matches Cocoa's bandana. I gifted it today and she loved it! I am participating in a swap on IG. It was to swap either a mini quilt or a pillow cover. I opted for the pillow cover as I have a LOT of mini quilts. That meant I had to make a pillow cover. It is a blind swap meaning you get assigned a person to make/send to but have no idea who has you. I don't know if my person reads my blog so I won't say more than that right now. We had to fill out a form with likes, dislikes, etc. I decided I wanted to make a Hipster Cat pillow cover. 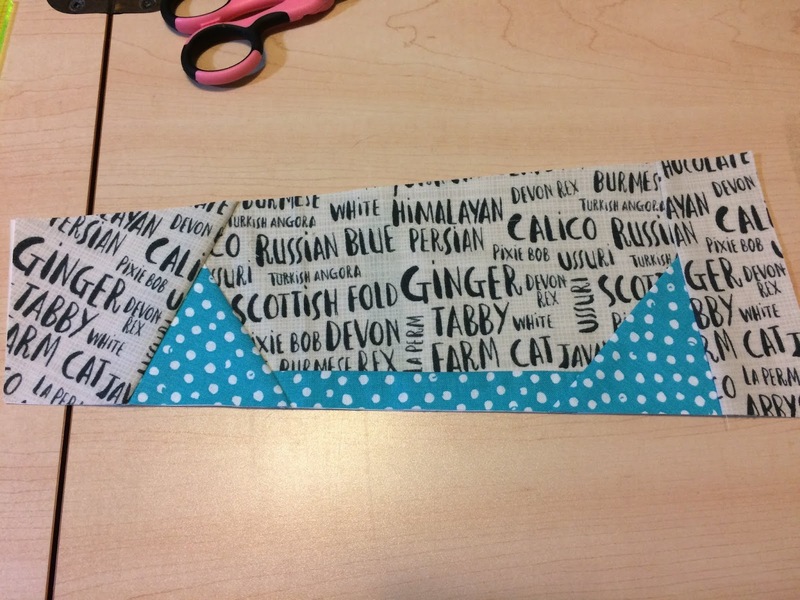 The pattern is by Sewing With Squeak. She has cute patterns! It is FPP and it went together pretty well. I used cat breed words for the background and quilted it with straight lines but also outlined the cat. These were my fabric choices. I got the top of the head pieced and knew I had made a good choice! Such a cute little nose! 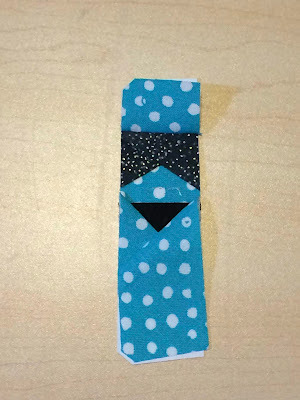 Stripes made an awesome bow tie. You can see the quilting too. Here he is in all his aqua glory. that I used for his glasses. I had this really cool almost gray suit material that I put on the back. It reminded me of a man's nice gray suit. 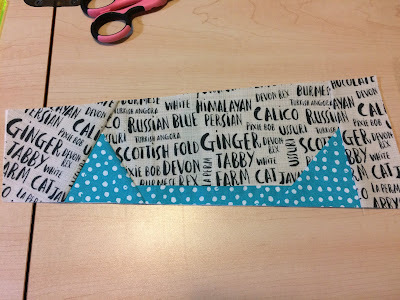 I used the envelope back tutorial from Crazy Mom Quilts to make my back. I sure hope my partner likes this one. It is totally one I could keep!!! I have more to share soon. 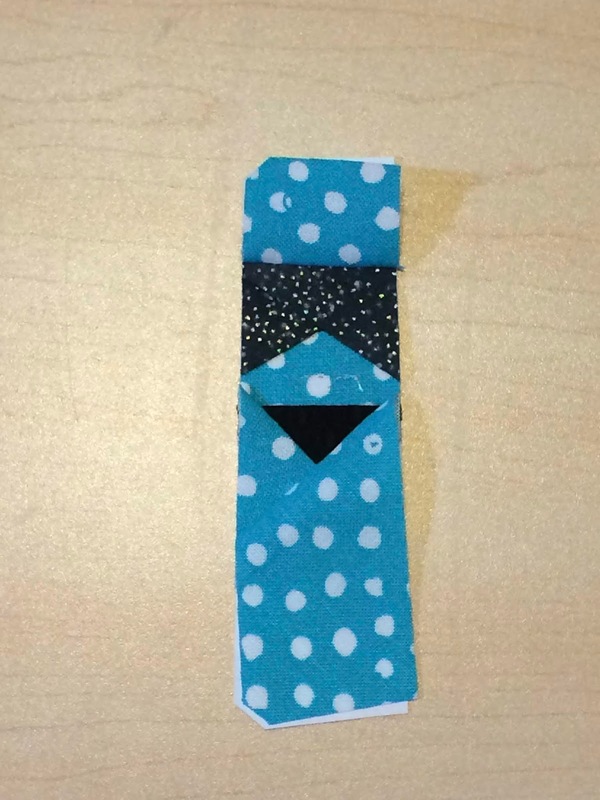 We had to make another handmade item to send and mine is almost finished.